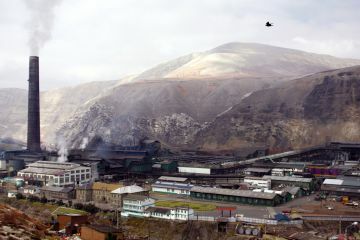 A US metal smelter in Peru was closed after turning La Oroya into one of the world's most polluted towns. Now it could reopen. LIMA, Peru -- For almost 90 years, the smelter at La Oroya, high in the Peruvian Andes, spewed out a toxic cocktail of heavy metals that slowly poisoned the town’s people. Now -- despite concerns that Renco Group, the US company that runs the plant, has largely failed to install the new technology needed to prevent it from again emitting clouds of deadly smoke -- the smelter may be set to reopen. In one study, by St. Louis University in 2005, more than 90 percent of children from La Oroya had excessive levels of lead in their bodies. And ambient levels of sulfur dioxide, which causes acid rain, have been recorded at a mind-boggling 27,000 parts per cubic meter -- almost 100 times the limit established by Peruvian law. Now, three years later, local congressman Casio Huaire is attempting to get the Peruvian Congress to pass a new law giving Doe Run Peru two more years to complete the environmental clean up -- and allow the smelter to operate in the meantime.